We thank you for allowing us to take care of your dental needs and we look forward to serving you. We understand that your choice of a dentist is very important to you. Most individuals think about the dental office only when they have a toothache, or need their teeth cleaned. In actuality, Dr. Hope Taylor is concerned about your overall health. For this reason, we have established this website to provide you with information that combines dentistry with medicine insuring your overall oral health. 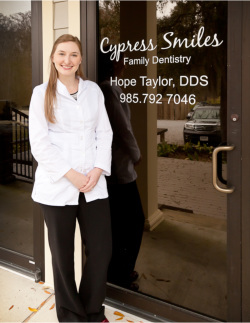 If you are looking for a great Madisonville Dentist, send us an email today!